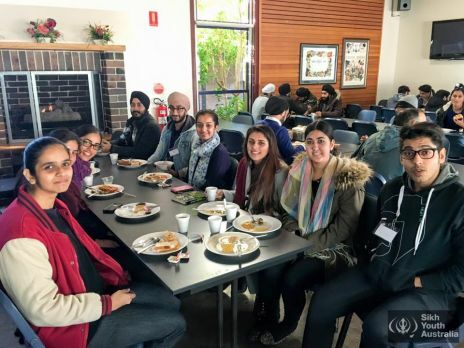 Sikh Youth Australia, over the last decade, has provided Australian and International youth with the opportunity to construct a competitive edge in today’s fast-paced world by refining their leadership skills. In this day and age, a degree and good grades just won’t cut it. Boundaries must be pushed and limits must be overcome, both personally and professionally, if we wish to advance both as individuals and as a community. The slogan rung out in my head for days in anticipation for camp. To say that I was ‘hella pumped’ is gross understatement but it’ll have to do. This camp for me, just like many others, started with the generic packing of the standard items that you would require while away from the comforts of your commodious abode (aka home). I seemed ready to conquer whatever self-awareness scheme this camp had waiting for me. Fully equipped with my pens, pencils, notepad and chunni, I was ready to tackle my weaknesses head on but nothing I took with me that day could have equipped me for the confronting challenges that lay ahead. Upon arrival you could literally feel the unequivocal buzzing of positive energy. Hugs were exchanged between familiar faces, smiles were as prominent as ever and hearty laughs filled the walls of the registration room. It felt peculiarly like home so it was a good thing that we’d all be spending three days together. The vibe of this camp was noticeably different to that of the annual summer camp. There was something more cultivated about the breeze that swept over it - my first leadership camp. I guess that’s the kind of maturity experienced when you’re surrounded by a sea of fresh-blooded, ambitious adults. There were three workshops offered by SYA but I, unfortunately, could not be in three places at once no matter how hard I tried to master multilocation or some form of quantum physics. So indeed, I had to start from stage one, what is known as ‘The Lighthouse Workshop’. Without going into too much detail and risking the spillage of some of the many trade secrets learnt at the workshop, let me just say this – there is only one word that could describe this orchestra of professional workplace genius. Ah-may-zing! The workshop was mentored and facilitated by Jasbir Singh from Singapore, a Leadership Consultant at Heidrick and Stuggles who specialises in Leadership Assessment and Development for High Potential leaders and CEO Succession Planning. It was safe to say that us youth were in good hands, don’t you think? This workshop focused on the importance of self-awareness. It basically held a mirror to our faces and frantically screamed “WHO ARE YOU? !” and “WHAT DO YOU WANT?” repeatedly. It’s not as terrifying as it sounds. Rather soothing in fact. I think it is a reality check that we all needed. How can one lead others until one can lead him/herself? Jasbir, with his straight-forward, ‘no nonsense’ attitude gave it to us straight up. There is no one standing in your way except for yourself. There is no room for excuses, blame or dogged self-pity if success is the aim. There is no doubt that the workshop got intensely ardent, peaking at day two and resisting plateau with the day to follow. The string of abstract games, lively activities and intimate sharing will no doubt be reflected upon fondly by all participants. The Lighthouse Workshop was a dynamic personal and professional journey which I would recommend to anyone who wants to add a little ‘maximum value’ masala into their life. I can’t wait till next year. Bring it on!